Cannabis quality control starts with the growers. Whether supplying their products in the B2B or B2C sector, growers and cultivators need to ensure the highest quality marijuana product free from pesticides, micro-organisms, and other impurities. Modern Canna Science is among the few labs that implement strict quality control practices. Unfortunately, most states don’t have a standard of practice or checks and balances for ensuring quality control. While the EPA has enacted the Pesticide Tolerance Limits for minimizing pesticide use on crops, there is currently no such thing in place for hemp and cannabis crops. Aside from growers, there is also a lack of quality control within most cannabis testing labs. This is especially true with respect to testing labs on the West Coast. 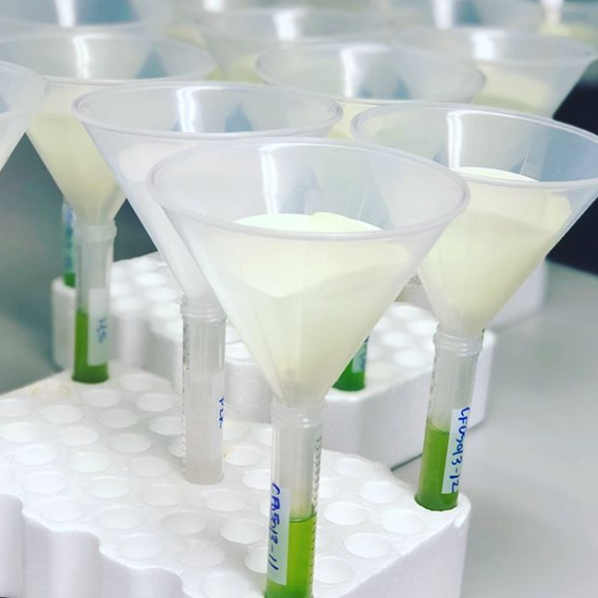 Federal and state quality control measures will likely be enacted in the future, and Modern Canna Science wants to stay ahead of the curve when it comes to cannabis quality control testing protocols. Modern Canna offers multiple quality control packages. A standard Level II package includes QC result samples associated with the client sample. This includes the method blank, a laboratory control sample, a laboratory control sample duplicate, a matrix spike, and matrix spike duplicate. Method Blank – A Method Blank is a contaminant free pure matrix that is used to identify possible contamination in the handling and preparation of the sample batch. Matrix Spike (MS) – MS samples are separated into three segments. One segment is used to determine which target analytes are present, while the other two are spiked by the laboratory with a known concentration of the target analyte. The spiked sample is prepared and ran together with the un-spiked samples. The amount of analyte that is recovered from the spiked sample is identified, quantified, and reported as “percent recovery”. The term “Matrix” refers to the actual material of the sample. The MS allows the laboratory to demonstrate method accuracy for a particular sample material. Matrix Spike Duplicate (MSD) – Duplicate control sample that is processed with each batch. Laboratory Control Sample (LCS) – LCS samples are also contaminant free and are spiked with a known concentration of the target analyte. Unlike the MS and MSD, the LCS allows the analysts to determine analyte recovery accuracy without any matrix interference’s. Laboratory Control Sample Duplicate (LCSD) – Duplicate control sample that is processed with each batch. Clients may also opt for an extended Level III quality control package. This includes everything under Level II in addition to quality control for all equipment and instrumentation used. This includes a report with the full instrument and calibration data. When calibrating our instruments, we use the calibration curve measurement. We use the calibration model when analyzing a sample. This is done by comparing the client sample, which is of unknown concentration, to a set of standard samples whose concentration is known. The calibration curve helps us understand the instrumental response to an analyte and determine the concentration of the unknown (client) sample. For greater accuracy, we run the standard samples in the same matrix as the unknown sample. A matrix contains all the components of the sample minus the analyte of interest. This includes all proteins, metals, ions, salts, etc. Modern Canna tackles quality control on an internal and external basis. This includes the monitoring of all testing procedures, equipment, and personnel. The equipment monitoring, for example, may include regular interval checkups of incubators to confirm they’re at the right temperatures. Likewise, monitoring of staff ensures they follow stringent protocol and don’t engage in “shortcuts” or cut corners that may invalidate test results. This is an overview analysis of our internal quality control by an external agency. This may include an assessment of the lab’s results and detecting constant differences from results of other labs when testing the same or near-identical samples. External quality control ensures long-term accuracy and adherence to the latest quality control regulations. Some labs that claim they meet quality control practices only implement internal quality control measures. Both internal and external controls are necessary to ensure standard operating procedures are met. This is a procedure that determines the performance of individual labs for specific tests and measurements. Clients can be sure that our testing meets many quality assurance standards. While quality control utilizes statistical measurements to analyze a lab’s ability to analytical specifications, quality assurance is about ensuring the adherence of proper testing guidelines and protocol. Without quality control in place, how can you attest to the validity of the results of your returned samples? Our cannabis testing lab has state-of-the-art equipment, unsurpassed staff expertise, and strict quality control guidelines. Contact Modern Canna and submit a sample to a lab that meets quality control and all regulatory standards in the state of Florida.